The Cuyahoga County Solid Waste Management District is accepting applications for its 2016 Master Recycler class. The lectures and tours (four lectures, alternating weekly with four tours/field trips) explored and clarified many of the confusing aspects of recycling and what determines what goes into the recycling bin. I encourage anyone with a commitment to zero waste/waste reduction, waste management, or recycling to consider the Master Recycler program. But don’t dally: only a few spots remain for this year’s class. You’ll have the opportunity to develop an in-depth understanding of solid waste management issues and practices, including waste reduction, composting, and recycling. Through service learning and volunteer opportunities, you can become a volunteer educator who can represent the District and its mission. This year’s classes begin Wednesday evening, September 14. For application procedures and details about the program’s requirements and activities, program eligibility, and potential topics and tours, see the Cuyahoga County Solid Waste District website. Teachers, students, community groups, churches, day care operators, anyone: the Cuyahoga County Solid Waste District has lots of binders left over from Zero Landfill Cleveland’s operations this past summer. What: binders of various sizes, colors, capacities, perfect for organizing and displaying information and materials. Where they came from: surplus materials donated to Zero Landfill Cleveland by the local graphic design, interior design and architectural community. Who: free to anyone who will pick them up. Where: Cuyahoga County Solid Waste District’s Garfield Heights facility, 4750 E 131st Street in Garfield Heights (map). More information: call (216) 443-3749. 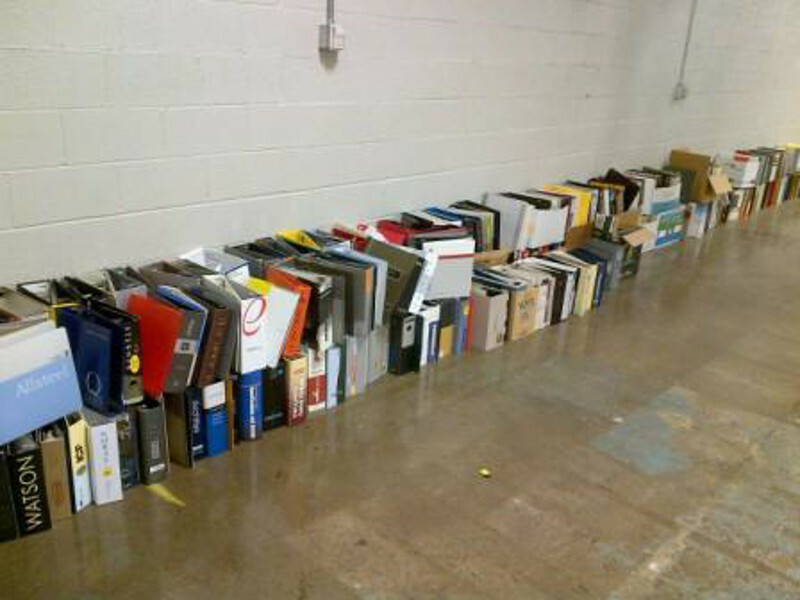 Zero Landfill Cleveland kept these binders out of the landfill. Now they’re looking for some good homes.